The faces of Japan’s TV news are changing. Broadcasters are under increasing political pressure from the government and a succession of outspoken anchors and newscasters have resigned. Experts worry the situation marks a crisis in TV journalism, for it is believed broadcasters are now exercising self-censorship as they seek to toe the administration’s line. Hosts Ichiro Furutachi of TV Asahi’s influential “Hodo Station” and Shigetada Kishii of the TBS evening news program “News 23” will both be replaced in April. NHK, too, is considering pulling longtime anchorwoman Hiroko Kuniya from its “Close-up Gendai” news and features program. Furutachi has often been criticized by the government and its supporters for his commentaries. Kuniya’s departure has long been whispered about as she is known for asking big-name politicians tough questions. However, she has survived until now. Similarly, Kishii expressed opposition to contentious security bills before they cleared the Diet last September and called on fellow opponents to speak up. “Voices should continuously be raised (for the bills) to be scrapped,” he declared. Criticism was heaped upon him, particularly from the right. One conservative political group said his statement violated the Broadcast Law, which states broadcasters must be politically impartial. On Tuesday, TBS named Hiroshi Hoshi, 60, a senior writer with the left-leaning Asahi Shimbun daily newspaper, as Kishii’s replacement. Some analysts see cause for alarm in the slew of anchor replacements. 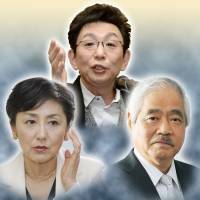 “There must be different reasons behind each station’s move, but if three journalists quit in succession, the audience would get the impression that it was the results of their criticism of the administration,” said Hiroyoshi Sunakawa, a professor of media studies at Rikkyo University. It was around the Lower House election of 2014 that the ruling Liberal Democratic Party began to exert stronger demands on TV stations. In one example, the government issued a document to Tokyo-based stations demanding that they “ensure fairness, neutrality and correctness” in their election coverage. In 2015, the LDP summoned TV executives for questioning over the content of the “Hodo Station” and “Close-up Gendai” programs. Having experienced that pressure, the stations now are believed to refrain from running content that criticizes the administration. “I don’t want to take risks,” said one young employee at a commercial TV station. A source close to NHK sighed and said there is a growing atmosphere among NHK staff that they should be second-guessing the administration’s expectations.